The forum electronic invoice Germany (FERD) has defined a common and comprehensive format for electronic invoices, which can be used for the exchange of invoices between companies, authorities and consumers. The ZUGFeRD format allows the exchange of structured data between invoicing party and invoice recipients. The ZUGFeRD format allows a structured way to transmit invoice data in a PDF file which can be read-out and processed. 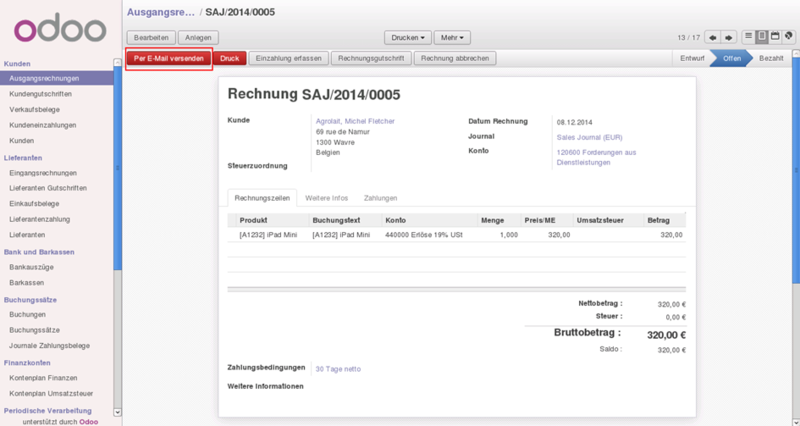 In this screen you can activate ZUGFeRD for Odoo. In addition it is possible to define specific reports where the ZUGFeRD document should be created. In the user configuration, there are more options regarding the report settings based on the user. Here it is possible to configure more details or to adjust individual assignments. By clicking the highlighted button the invoice is created. If there exists a configuration for the ZUGFeRD document, our module adds the corresponding ZUGFeRD data to the pdf. The displayed invoice attachment contains the PDF with the ZUGFeRD data. The pdf-file contains the XML document as an attachment.